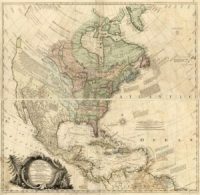 Along with the flood of Germanic farmers who entered the Port of Philadelphia during the 18th and early 19th centuries, there were tradesmen of all kinds who settled in country villages and served the surrounding farm families with their crafts. Skilled in their trades, part time and full time weavers, tailors, tanners, shoemakers, combmakers, hatmakers, smiths of all kinds, butchers, papermakers, clockmakers, bakers, and potters made life possible on the early farmsteads. It is the potters that are the subject of this week’s column. Perhaps more so than with any other trade, the potter was entirely responsible for his product, start to finish. The blacksmith, for example, did not smelt his own iron, nor the weaver raise his own flax; but the potter dug and prepared his clay, formed and fired his wares in his own kiln and usually retailed them directly to his customers. So necessary were the potters wares that he could sometimes sell out his entire kiln load in one day. Clay, of course, was the potter’s material, and it is with clay our story should start. Clay is highly variable and complex. It is composed of microscopic bits of weathered rock, and its characteristics depend on the rock from which it was eroded. 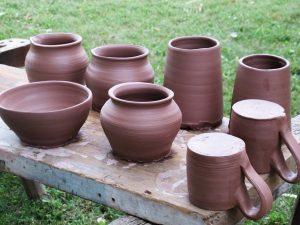 Most of the clay here in the New Hanover region has weathered from shales and mudstones that have a good bit of iron in the form of ferric oxide; hence, they fire out a soft red of the well known Pennsylvania German red ware. Surface clay is usually waterborne and deposited in beds in the floodplains of streams and rivers. Clay deposits a few hundred feet apart can have very different characteristics. Most of the streams and watercourses around here have clay deposits of one sort or another, and the best ones are free of sand and small stones. Local clay has significant organic matter and along with ubiquitous bacteria and such and can almost be seen as a living material. Indeed, clay “works” best if it is dug processed and then stored away for months or years. It emerges more plastic. As it is shoveled from its bed, clay is lumpy and unworkable. 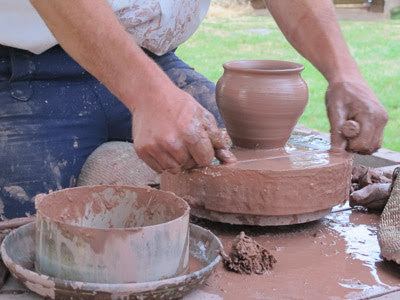 To render it ready for the potter’s wheel, clay needs to be sent through a grinder called a “mud mill” in the old days. Clay was rendered workable in this horse turned grinder consisting of a large heavy tub with a shaft fastened vertically to the center of the tub. A horizontal beam was hitched to a horse that walked round and round turning the shaft. On the shaft were blades that churned and mixed the clay. In more modern times a screw mixer called a pug mill does the same job. The number of full and part time potteries working at one time or another in this region during the eighteenth and nineteenth centuries is unknown. three hundred is a conservative estimate, but fewer than ten potters ever signed their work. 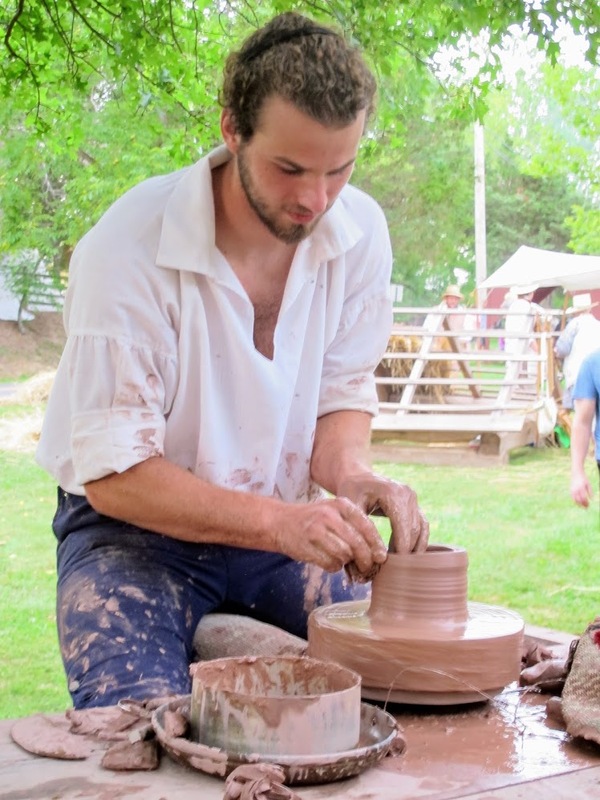 Bucks, Montgomery Berks and Lehigh Counties seemed to be the center of the pottery industry since they held the best and most diverse clay deposits. The annual production numbered in the millions of pieces of all shapes and sizes. There were decorative whimsies, but what filled the kilns were common utilitarian wares: apple butter pots, milk and cream pots, pie plates, coffee pots, flower pots, bowls, plates, and baking pans of all types. The interior surfaces of household items were covered with a lead glaze that made them waterproof but also, unfortunately, somewhat toxic if they held acidic foods. Oxides of copper, iron, manganese, and cobalt were added to glazes to achieve color accents. The threat of lead poisoning was no idle danger as well known potter Charles Stahl died of lead poisoning in 1896 as a result of his glazing work. There are virtually no primary documents recording formulas and details of glazing. Potters were descendants of the European guild system wherein “mysteries” of the craft were jealously guarded. Such things as glaze formulas and such were proprietary information and never written down. Indeed, Neiffer potter Jacob Meddinger would not even permit anyone in the room when he was mixing glazes. As detailed in last week’s column, there was probably no early tradesman who was, by necessity, more self reliant than the potter. He selected and dug his own clay, processed it, made his pots and other wares, glazed them with his own glazes, fired them in his kiln and finally sold much of his product directly from the kiln. 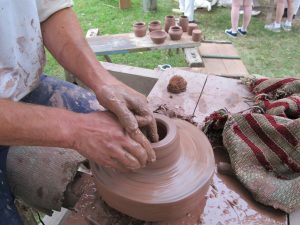 Montgomery, Berks, and Bucks Counties were the center of early pottery manufacture having a variety of easily worked clays that fired to a red, brown, or buff color depending on the amount of iron and other impurities they contained. Mostly plain, homely, utilitarian ware of everyday necessity, red ware vessels by the millions were produced in hundreds of full and part time potteries. The soil around every old homestead is salted with countless sherds that usually show clear or chocolate colored glazing sometimes with green embellishments on the interior surface of the vessel. These fragments from a myriad of pie plates, glazed flower pots, cups, crocks, jugs, and jars are so similar that it is impossible to distinguish where they were made or even in which century. The glaze compound was usually water and clay stirred to a creamy consistency with the addition of red lead as the flux which lowered the melting point of the clay in the glaze so as to form on the surface to which it was applied a clear waterproof coating of glass. The addition of a percentage of manganese, then called mangus, yielded a brown color; or copper oxide, known as vertigris, made green. These were the two most common colorants. Because the clay body is quite soft and does not combine with the hard glaze, the glaze is liable to craze and crack as the fired pot cools in the kiln. These cracks do not harm the piece. To form a thin, clear waterproof coating, lead powder could be dusted from a cloth bag directly onto the wet clay of the pot. Sometimes pie plates and meat platters were first decorated by means of a slip pot. To form a plate, a lump of clay was rolled out with a rolling pin much in the manner of pie dough. Liquid glaze called slip was then trailed in wiggly lines onto the soft clay from hollow quills that protruded from the bottom of a small vessel that held the liquid. Once the slip decoration had hardened a little, it too was rolled so as to press the decoration down into the clay and so provide an even surface. (This detail is often overlooked, or unknown, to modern potters). The leather hard clay is then draped over a mold and left to dry. Rare exceptions to the common, local red ware are the highly decorated, incised sgraffito plates of the 18th century. The first German immigrants brought the art of sgraffito and slip decoration with them even to the extent of using the tulip as a common motif. Using this method, the entire surface of the red clay plate was coated with a white or yellow slip. Then the design was “scratched” through the white coating to reveal the red clay beneath and the whole plate then was covered with a clear glaze. These were custom made presentation pieces usually having the recipient’s name, the date, and a bit of text or poetry circling the rim. “This is one of the most carefully executed examples of sgraffito ware which has come to light in Pennsylvania, the designs having been boldly carved through the layer of white slip into the red clay beneath, while splotches of dark green in the glaze relieve the monotony of red and white.